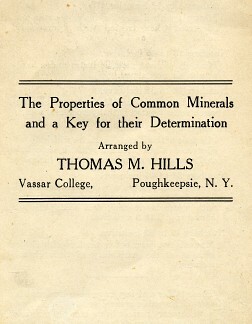 Between 1920, when he arrived at Vassar, and his retirement in 1948, professor of Geology and Chairman of the Geology Department Thomas Hills became one of the most popular professors at Vassar, known as "Uncle Tom" and renowned across campus for his teaching ability. 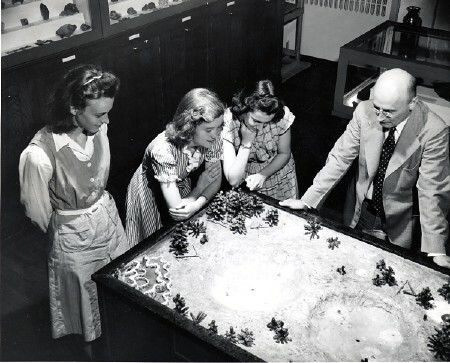 He modernized the Geology department, expanding the physical collections in the Geology Museum while adding new teaching devices such as dioramas, mineral keys, and large maps to both the museum and classrooms. The dioramas were particularly popular, and depicted everything from various minerals to prehistoric mammals. He replaced the idyllic boat trips up the Hudson that had characterized the Geology department since the nineteenth century with actual field trips to the most geologically interesting locations in the area. He even began a summer field study program that took students to Wyoming and Montana, backpacking across the Bighorn and Bitterroot Mountains. Born in Pittsburgh on February 19, 1881, Hills received his undergraduate degree in philosophy in 1902 from the College of Wooster. Before continuing to graduate work in geology, he spent a year working as an assistant at the Preparatory School at Wooster. From 1903 to 1907 he studied at the University of Chicago, but ultimately completed his degree at the University of Berlin in 1908. Upon graduation, he assumed his first teaching position as the Professor of Geology at the University of Toledo in Ohio. Then, from 1910 until 1920 he worked as an Assistant Professor of Geology at Ohio State University before coming to Vassar. In 1944, he was named an American Man of Science. A fellow both of the American Association for the Advancement of Science and the Geological Society of America, he remained connected with a wide scientific community. In 1916, he became the Vice President of the Ohio Academy of Science, and was twice president of the New York State Geological Association. He was also a member of Sigma Xi and the American Mineralogy Association. Hills traveled somewhat extensively within the United States, taking summer trips with students to places like Colorado or Montana to study geology beyond the Hudson Valley. In 1929, when he and his wife visited Africa to attend the International Geology Congress in Pretoria, they spent a year traveling, visiting geological wonders and exploring diamond and gold mines. A handout Hills designed for his students. Hills was also very active in his local communities. At Ohio State during World War I, he organized and ran the Department of Observation in the School of Military Aeronautics. There, he taught students war-related skills: how to make maps, rig airplanes, and operate and repair machine guns and wireless radios. In Poughkeepsie, his community involvement was different in nature but no less committed. He became an Elder of Poughkeepsie's First Presbyterian Church in 1925, and from 1942 until 1945, he served as chairman of the Dutchess County Chapter of the Red Cross, organizing aid in and outside of America during World War II. 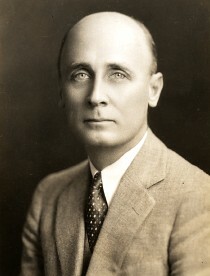 He also became a member of the board of trustees for the Vassar Brothers Hospital in 1945. Accustomed to his volunteer work, the Poughkeepsie community was familiar with his scholarship as well. Because he made the Hudson Valley the center of his geological research, the local newspapers periodically interviewed him, asking for comments on the area’s geological history as "local interest" stories. Hills died in 1970 at the age of eighty-nine, predeceased by his wife and daughter. Throughout his career, he moved his students with his knowledge and enthusiasm. A number of these students went on to successful geological careers of their own and spoke of "Uncle Tom's" role in encouraging their academic aspirations. His teaching ability, generosity, and ingenuity certainly inspired all who met him, both at Vassar and in Poughkeepsie itself. Emsley, John. "Professor Hills Discusses Dutchess Before Refrigerators were Needed" The Poughkeepsie Star-Enterprise 26 June 1937. "In South Africa" The Poughkeepsie Evening Star 21 September 1929. Myers, Helen. "Mother Earth Uses Cold Cream For Her Wrinkles" The Poughkeepsie New Yorker 10 September 1950. "Thomas Hills," Biography File, Special Collections, Vassar College Library.